I have to admit, its that time of year, where I want to just slip under the covers in the morning, and not get up. But when I finally do, I see all the different colors of nature that makes me want to stay outside until the sun does down... but then reality kicks in on the side of I have to defrost my windows so I can see out of the back of the car... what a time of year where you can become bipolar... anyways.. enough of that. When this card was made I think it was to be a sympathy card, but I couldn't see that I would use it as one, so didn't ink it up in the workshop I was attending. I loved the detail of it being embossed and brayered. 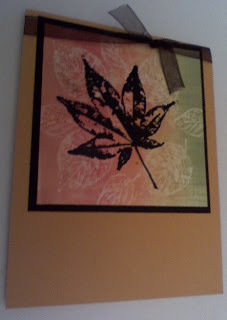 Brayer --- you might say... its a technique that I do not remember to do often enough.. but you use your versamark ink on glossy paper, then roll your brayer tool in an ink color and over the images on the glossy paper. The ink that you are putting on with the brayer tool, come to life and you can emboss on top- or leave as is.